StartupJuncture visited Greece this week to learn from Greek entrepreneurs about their current situation. We came to a surprisingly simple conclusion: Greece’s main problem is not debt but unemployment, especially youth unemployment. Stimulating Greek entrepreneurship is therefore the action Europe should take to help solve the crisis. Greece as a country is at a crossroads. One of it’s main problem, perhaps even the fundamental problem in the crisis, is massive unemployment. There are are no new jobs for people who graduate or loose their old job. Greece has to either create now jobs quickly or suffer from mass emigration. This is true for Greece as a whole but is even more apparent outside the capital. Cities like Patras have a good university but have even fewer jobs to offer. Graduates are forced to leave, leading to an unwanted brain drain. Based on our interviews with Greek graduates, professors and entrepreneurs and visiting Athens and Patras, we would like to make a bold statement: Most politicians, especially the ones arguing over debt and financial issues are doing the wrong thing. They focus on debt, financial issues and austerity. These measures hurt rather than help Greece. The political discussion should be focused on solving the unemployment problem. To clarify this point a simple analogy is useful. Suppose a house is on fire. The fire is the real problem. It is life threatening and deserves everyone’s full and immediate attention. It does not matter how the fire started, whether the building passed its last inspection and who stored the gasoline in the basement. The Greek unemployment is as bad as a house being on fire: people cannot live without jobs. Until the unemployment problem is fixed, it does not matter whether EU, IMF or the Greek government caused the problem. A huge amount of jobs in both the public and private sector have disappeared and new jobs are needed. Like Neelie Kroes said in a previous interview, jobs are not created by politicians, but by entrepreneurs. Greece needs a new generation of business minded graduates that know how to create their own jobs and build businesses that employ others. The only useful thing politicians can do is to enable and encourage entrepreneurship. A small group of entrepreneurs can make a big impact, even if they do not start the next Facebook. If 100 Greek new businesses bring in new revenue into the country, employ 10 people or more after two years and after two years each founder becomes mentor of another startup, more than 50.000 jobs would be created in the next 8 years and the crisis would be over soon after that (for the econometrists, the numbers are based on a Fibonacci sequence). Tolis Aivalis, Greek innovation, Strategy and Marketing technologist. He shared his experience on the changes and job losses he has seen, and recommended people the read the business classic: “Who moved my Cheese”. Society is changing and Greek people and companies should stop fighting the change, but change as well and seize new opportunities. Practically this requires new skills: a focus on execution unstead of ides, understanding business models models and new marketing skills. Dimis Michailides, keynote speaker and author of theartofinnovation (you can see him speak and perform magic in this TED talk). He emphasized the fundamental need for organisations to become more creative. He illustrated his point by looking at the increasing speed of change in art history. In response to the high rate of change, organisations need to put in place sources of creativity, but also processes and culture. They should for instance enable people to take moderate risks without fear of career setbacks. The author was invited to teach entrepreneurial skills. Based on the experience of many Dutch startup founders, the emphasis was on Lean Startup methodology. 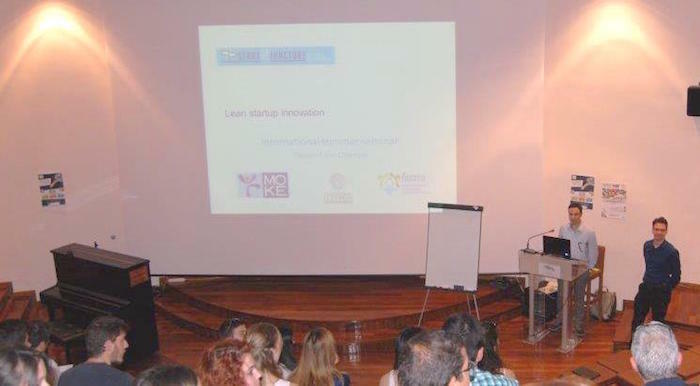 Can one seminar on entrepreneurship save Greece? Probably not. Greek entrepreneurs however can, if they are supported by a local ecosystem. All Greek entrepreneurs and graduates interviewed are extremely motivated to get to work. They deserve an ecosystem like The Netherlands has to help them get started. European politicians but also journalists would do well to look beyond the financial debt discussions and focus on entrepreneurship. One Dutch institute that is making progress is The Dutch embassy, led by Dutch ambassador Jan Versteeg. The embassy started Orange Grove, an incubator that hosts a community of new Greek entrepreneurs. Other success stories can also be found: There are Greek startups that is doing well despite their challenging circumstances. Transifex has just received € 2.5 million in funding. Another example of a successful but relatively unknown Greek startup is the high tech sound processing expert group Accusonus: this company makes software that is used to for getting the percussion to sound just right for many US artists. The capital controls make life harder than it should be. People are standing in line for ATMs to have access to their own money. Apparently, the best time to do this is around midnight, so one can get two day’s worth of money in one trip. The possibility of a Greek exit from the euro (‘Grexit’) is forcing innovative companies to keep extra bank accounts and increases the administrative burden. A final decision on the currency to use would bring clarity and help recovery. Most entrepreneurs would prefer to stay in the Eurozone as makes obtaining external funding easier. Startup facilities are now mostly present in Athens, forcing graduates to move from other cities to Athens. It would be of great help if startup institutions like Orange Grove would branch out to other cities. Startups need customers. Greek corporates and international companies present in Greece could do themselves a huge favour by supporting startup facilities and act as pilot customers and launching customers for Greek startups. Some companies are already doing this. European and international investors, accelerators and events must take an active interest in the activities and funding needs of Greek startups and participate in the Greek startup scene. Without a functioning European startup ecosystem, all truly ambitious Greek entrepreneurs will be driven to Silicon Valley: a loss not just for Greece but also for the rest of Europe. We hope this article inspires everyone to take the right actions. With StartupJuncture we are trying to do our part by making Greek startups internationally visible. Let’s hope this will lead to more entrepreneurial activity and eventually to more jobs in Greece. Sharing this article via linkedin, Facebook and twitter is appreciated. Republishing of this article is also appreciated and permitted. If you have additional comments or suggestions, let us know via comments. Finally, we would like to thank the University of Patras for organizing the international seminar, Yiannis Kanellopoulos for helping us connect with local entrepreneurs and all participants of the seminar and the entrepreneurs interviewed for their contributions.